The Black Forest (Schwarzwald) is a region in Baden-Württemberg in southwest Germany. 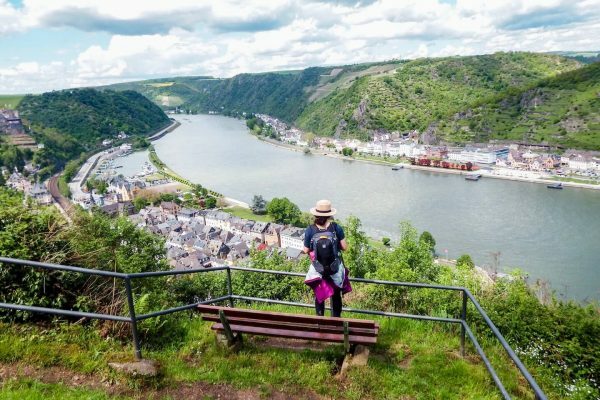 It’s famous for its dense forests, picturesque villages, hiking trails, and thermal spa towns. It’s also the land of cuckoo clocks, chocolate cherry cake, large wooden farmsteads, and thermal spas. 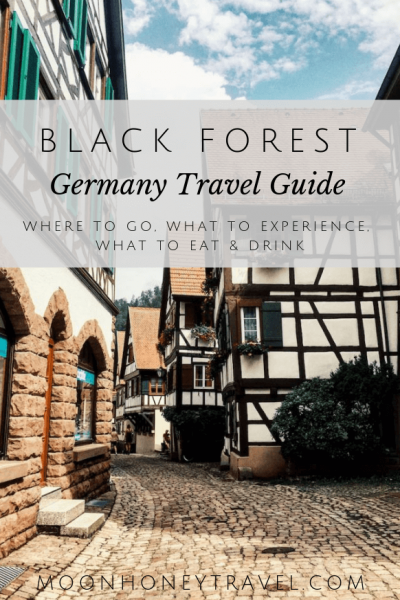 Driving through the Schwarzwald’s dark conifer forests, you’ll understand why so many Brothers Grimm fairy tales were inspired by this corner of Germany. Our favorite part about exploring the Black Forest was visiting the bathhouses in Baden-Baden and Bad Wildbad. We’ve included all our recommendations and tips below. Here at the Friedrichsbad, you lose track of time within 10 minutes and track of the world within 20. No trip to the Black Forest is complete without visiting the historic spa town of Baden – Baden. We highly recommend spending a few luxurious days here in order to enjoy the town’s famous bathhouses. Budget | There aren’t a lot of budget options in Baden-Baden. Assuming you have rented a car, it’s better to stay outside of the town. We stayed in Ferienwohnung am Kugelberg, an apartment in Gernsbach, which is 12 km from Baden-Baden. 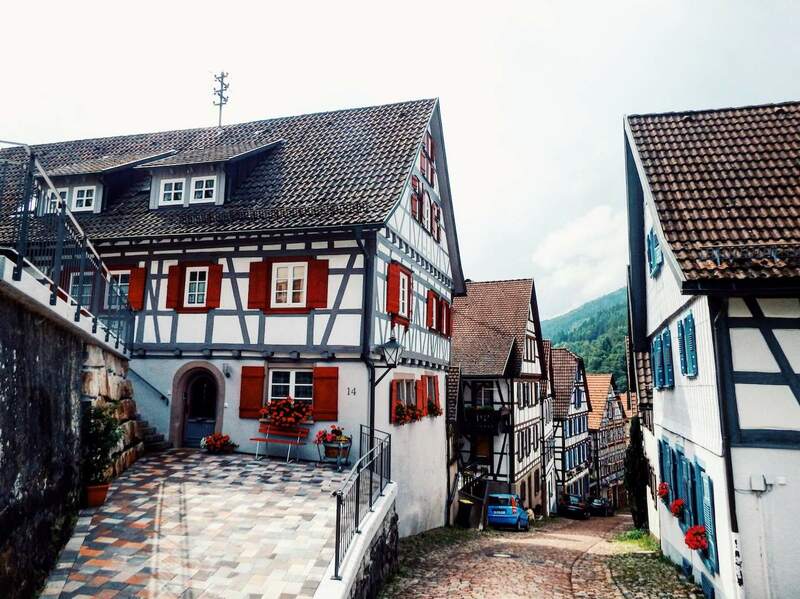 It was perfect for us and also nice to see another charming Black Forest village. Mid-Range | Hotel am Markt is a family-run guesthouse located in the Old Town of Baden-Baden. Though the guesthouse building dates back to the 18th century, all the rooms are modern and spotless. Luxury | Belle Epoque is a romantic hotel with lavishly decorated rooms. Built in 1874, the villa is surrounded by expansive grounds. Kinzig and Gutach valleys form the heart of the Black Forest. 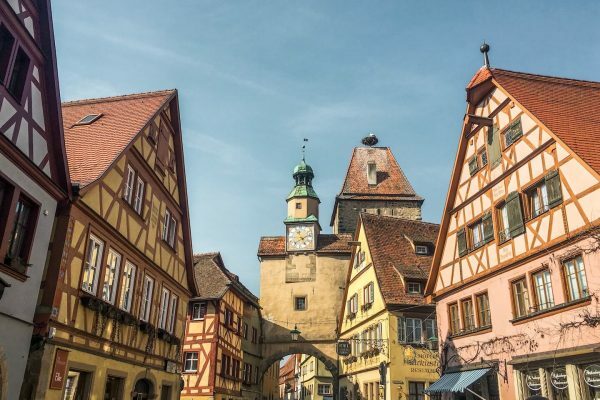 This is where many of the region’s celebrated customs originated, like the beautiful cuckoo clock and the Bollenhut, a flamboyant hat for women. As you drive through these valleys, you’ll see old farmsteads, picturesque medieval towns, and rolling forests. To reach these destinations from Baden-Baden, take the Schwarzwaldhochstrasse (Black Forest High Street). 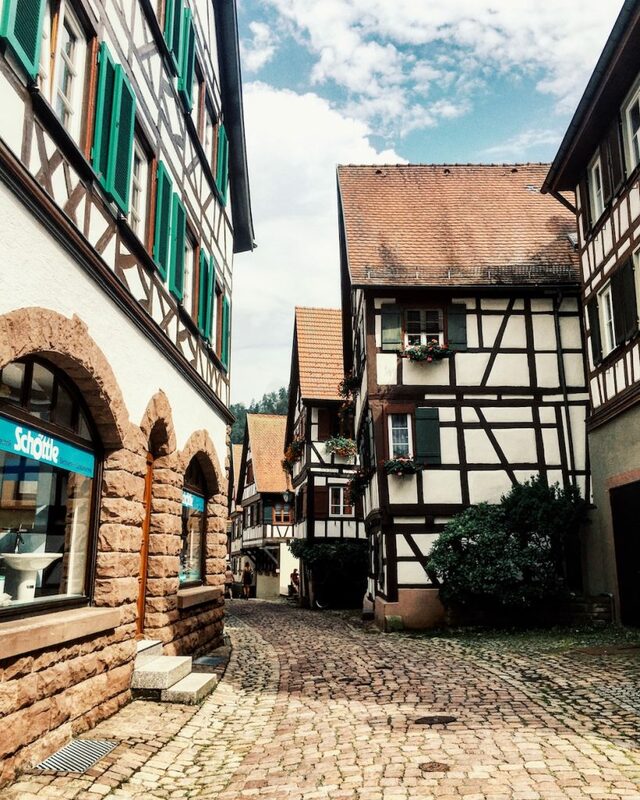 Look for accommodation in Gutach, Wolfach and, or Schiltach. 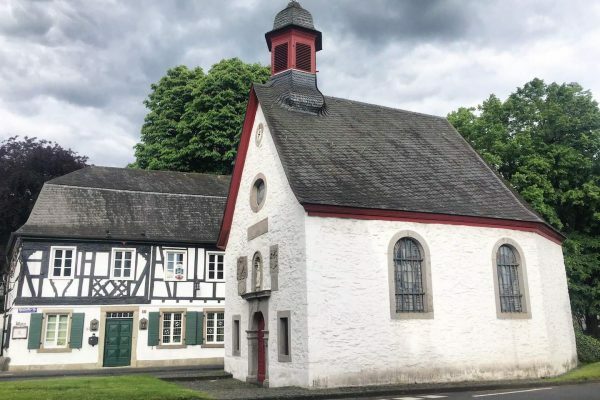 Budget | Rommelehof is a farmhouse situated in Gutach. It’s more than just a place to sleep; it’s a complete experience. We loved staying in this lively environment, surrounded by cows, pigs, and kittens. Families with children will love this place too. Visiting a Therme is an essential experience to have in Germany. It’s not only relaxing, but it’s also a cultural experience that’s very valued by the German people. 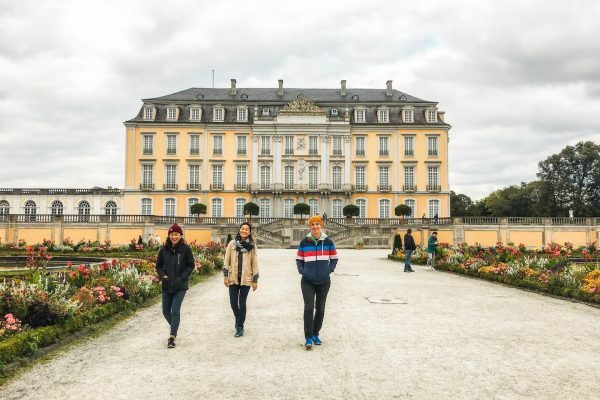 If you’re in the Black Forest, add Palais Thermal to your itinerary. This breathtaking bathhouse is located in the spa town of Bad Wildbad, where people have been bathing in the healing waters since 1521. 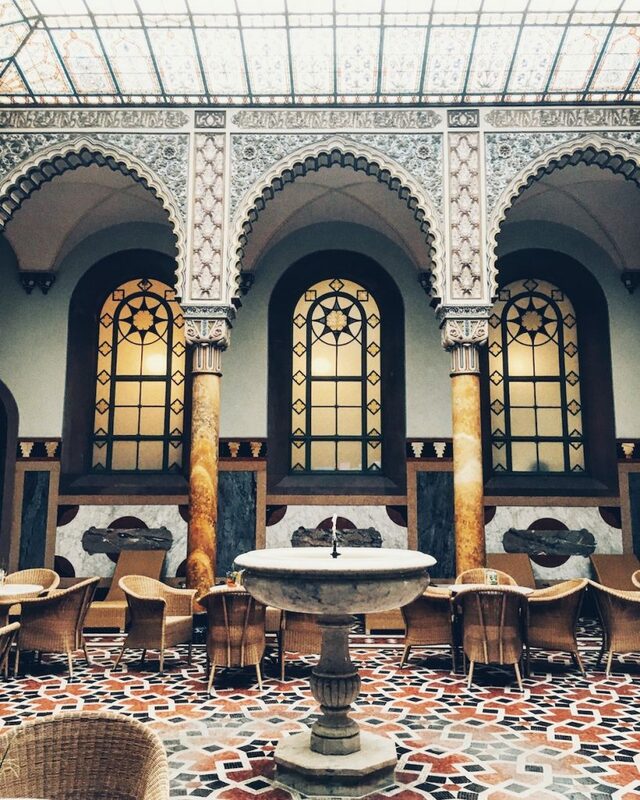 As you hop from one thermal pool to another (12 in total), you’ll be surrounded by sculptures, mosaics, painted columns and arches, and stained glass ceilings and windows. When it’s time for something to eat, head to the Moorish Hall – a splendidly decorated and light-filled dining space. The Palais also contains a three-floor sauna complex with thermal pools, saunas, relaxation rooms, and sun decks. How much Time. We spent 5 hours here. You’ll need at least that amount of time to experience all the levels. And, if you’re interested in a wellness treatment, add on additional time. What to Bring. Bring a bathing suit, waterproof flip flops, two towels, toiletries (soap, shampoo, etc…), and a bathrobe. Note: bathing suits are optional on the bottom floor, where the bathhouse is. The sauna area is “textile-free,” which means you’re not allowed to wear a bathing suit. Palais Thermal Website. Check out the website for special offers and pricing. It’s a lot cheaper than you might think. A student (until age 30) entrance fee is only 14 EUR. If you’re in Baden-Baden, which means “to bathe – to bathe,” then you really have to do the “to bathe” thing. 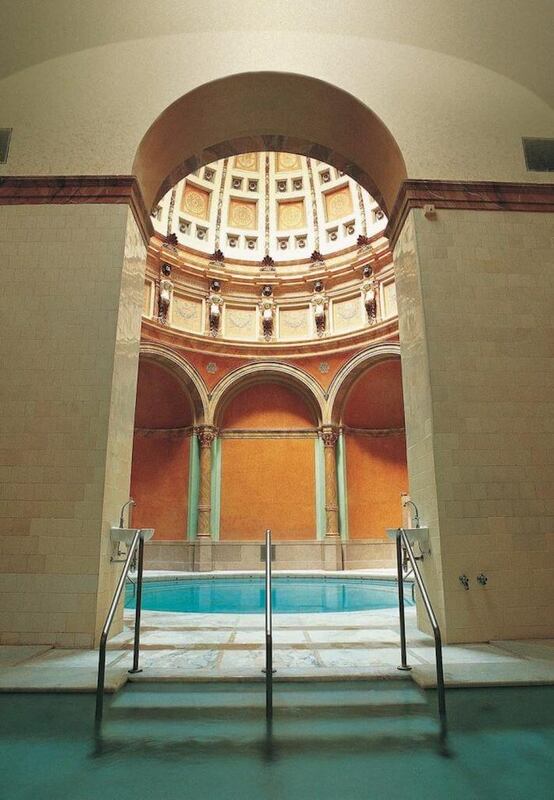 It was the Romans who first discovered the healing waters of Baden-Baden and set up a wellness complex here for their soldiers and citizens. The foundations of the Roman bath ruins are still viewable below Friedrichsbad. Today, this historical spa town is home to two famous thermal spas: Friedrichsbad and Caracalla Spa. We visited Friedrichsbad in the low season (August), which was incredible, because we counted only 10 people during our entire visit. Friedrichsbad was opened in 1877 and at the time was considered the most modern bathing establishment in Europe. The main attraction was and is the mineral thermal water rich in calcium and magnesium. The concept of the spa is achieving relaxing through a sequence of warm and hot dry air baths, a soap & brush massage, steam baths, thermal pools, and thermal water showers. You’ll be guided (via signs) through a 17 station journey through the spa. The signs let you know how many minutes you should spend at each station. But, definitely read through the 17 steps on the website before visiting, so you’re acquainted with the process. It’ll make for a more relaxing experience. There are specified days when men and women bathe together, and other days when they bathe separately. You don’t need to bring anything. Towels and sandals are provided. Textile-Free Spa. You only get to wear your birthday suit. Americans: It’s not as weird as you might think. There are different package options to consider. We recommend opting for the “Wellness” package which gives you 3.5 hours in the spa as well as a soap & brush massage that stimulates blood circulation. You’ll also feel squeaky clean after that 8 minute scrub. After you’re done bathing, head to Weinstube Baldreit for wine and flammkuchen (alsatian pizza) in a hidden courtyard. This Alternative Wolf and Bear Park is a retirement home and refuge for bears that have been abused and mistreated by humans (e.g. circuses). 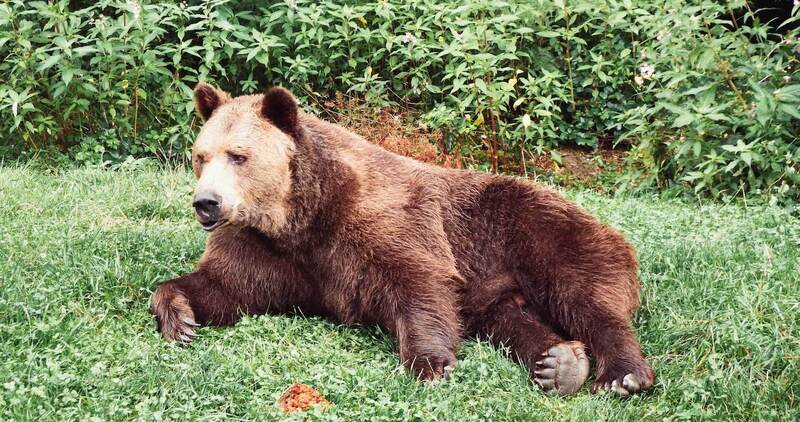 These bears are incapable of living in the wild, because their behavior has been shaped by human treatment. 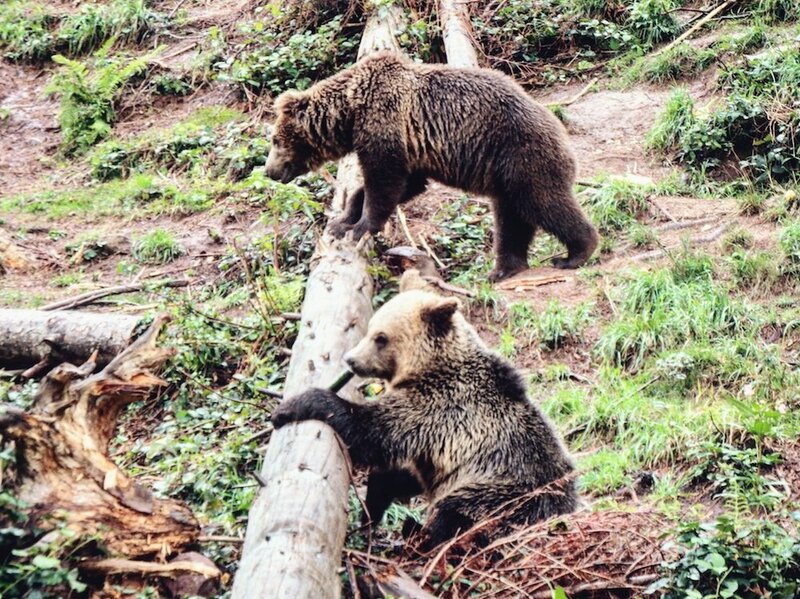 The goal of this park is to provide a safe and spacious area for these bears to live in. The park is also home to several wolves. If you love animals like us and want to support a great organization, visit this park. You’ll need about 1.5 hours to walk the 2 km circuit. 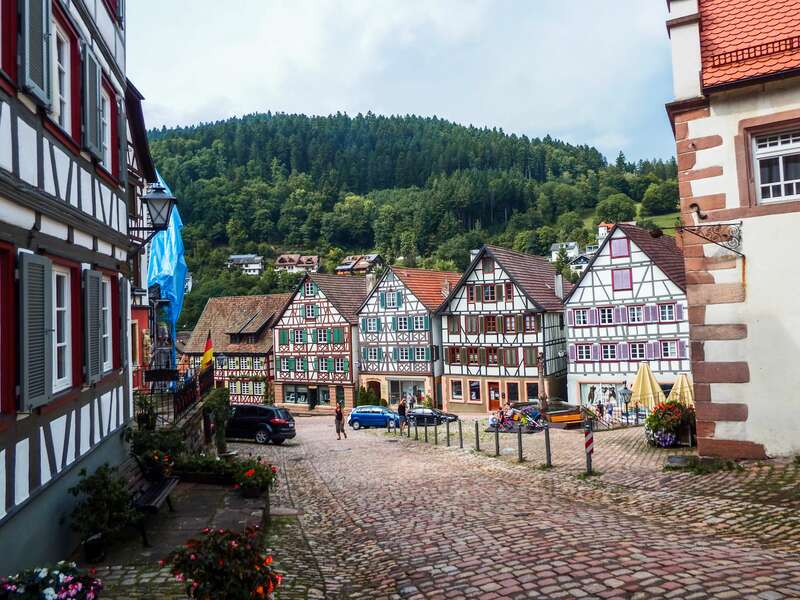 Located in the Kinzig Valley of the Black Forest, Schiltach is a story-book town with beautifully restored half-timbered houses. The triangular Marktplatz (Market Square) is the heart of the old town. The town well with the lion dates back to the 15th century (though renovated in 1750) and is the symbol of the independent status of the market, which was given in 1430. You’ll also find a renaissance style Rathaus with crow-step gables in the Marktplatz. After enjoying the beauty of the old town, go to Café Bachbeck for coffee and a slice of their Schwarzwälder-Kirsch-Torte (Black Forest Cherry Cake). Freiburg is a lively city of 220,000 people in the south-western region of the Black Forest. 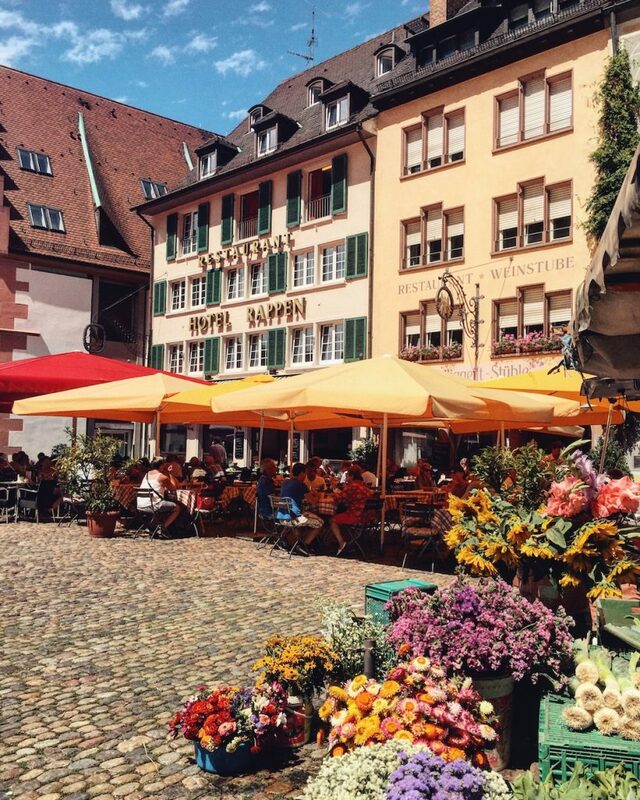 With a charming medieval old town and dynamic café culture, Freiburg harmoniously balances the old and the new. Narrow water-filled rills (in German: Bächle) run through the city center. In summer, children and dogs dip their feet and play in these waterways. Definitely visit the daily market (Monday-Saturday), located at the market square next to the Cathedral (Freiburger Münster). There you can buy fruits and vegetables and choose a sausage from at least seven different Würststände. There’s a lovely wine bar facing the cathedral called Alte Wache (Münsterplatz 38, 79098), which is the perfect place to sit outside on a sunny day and watch the action of the old town center. Marlene Dietrich said it was the most beautiful casino in the world. Inspired by his visit, Fyodor Dostoyevsky wrote The Gambler. Robert Schumann and Franz Liszt gave concerts in the Kurhaus’ grand halls. Visiting this Casino is an almost mandatory thing to do in Baden-Baden. 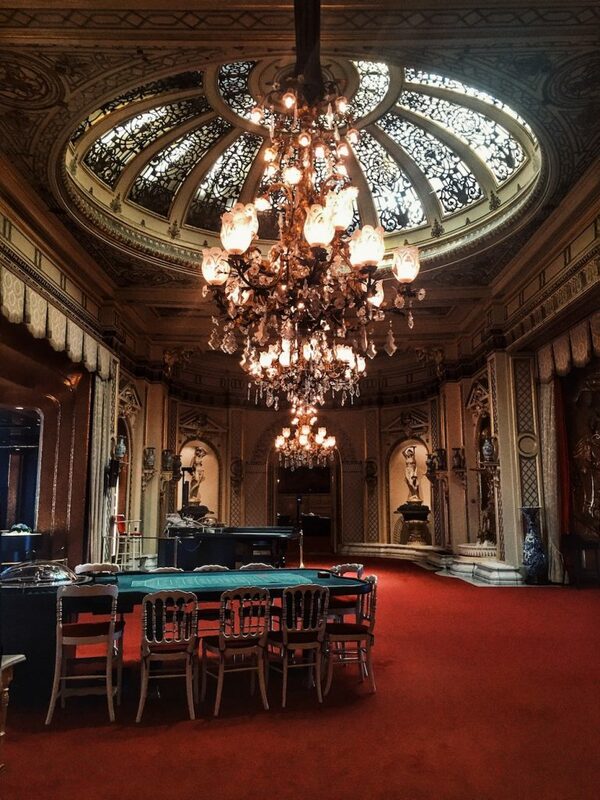 Though the casino’s golden age was in the 19th century, the splendor of the interior is still intact. The rooms are lavishly decorated in styles ranging from Louis XIV Versailles-inspired to Art Nouveau style and Florentine Renaissance. There are two ways to visit. You can either take a guided tour during the morning (7 EUR), or come at night in fine attire and with your passport (5 EUR) to play and watch. Here are the conditions for admission if you come during gambling hours. One of our favorite experiences was staying the night in the dairy farm Rommelehof in Gutach. In this lively environment, surrounded by cattle, kittens, and pigs, it’s fascinating to watch the family operate the farm. As guests, you can soak in Black Forest rural life, without having to do any of the hard work. 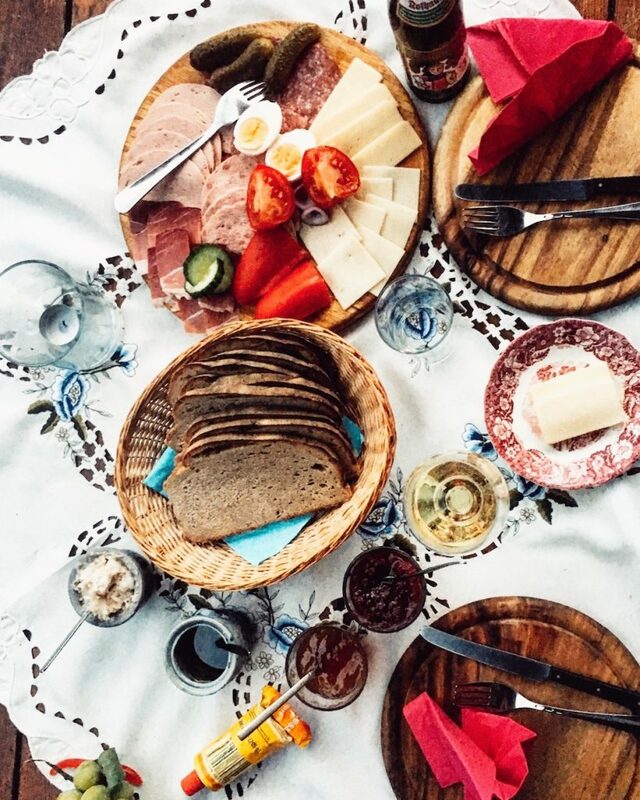 For dinner, we ordered a mixed plate of meats and cheeses and simply relaxed. In this region, farmers traditionally make their own Schnapps, an alcoholic beverage made with fruit. They’re very proud of their homemade fruit brandies and will gladly share them with you. Schwarzwälder Kirschtorte – this is the cake you have to eat in the Black Forest. It’s a layered cake containing cream, chocolate, cherries, and schnaps. Schwarzwälder Schinken – Black Forest Ham. Rothaus Pils Tannenzäpfle – This is the famous regional beer from the brewery Rothaus located in the heart of the Black Forest. Fürstlich Fürstenbergische Brauerei – regional beer. Use these guides to help plan your trip!